Médecins du Monde Japon (MdM Japon) has been present in Laos since 2012 and had implemented its first project in Champassak, which ended at the end of 2015, for the mother and child health project in collaboration with, one of MdM’s global network, Médecins du Monde France. MdM France had also worked in Savannakhet province from 1990 to 1997 for a surgical and obstetric program. In this way, MdM has a long working relationship with the health authorities in Lao PDR to contribute the health of people in Laos. The new project has been run since the beginning of 2017. The project is designed for 3 years at the beginning to serve better health for children under 5 years old in Xone and Huemeuang districts, Houaphan province. The ultimate goal of the project is to contribute to reduce mortality and morbidity rates of children under five years old. To achieve this goal, we set up following objectives. For each objectives, we implement following activities. Activity 1: IMCI ToT training, IMCI clinical training, supervision tool review, and enhancement of on-site supervision. Activity 2: Training/ workshop for Village Health Committee members and on-site supervision of Health Education/ promotion at the villages. Other objectives and activities emphasise on collaboration with relevant health authorities to find suitable ways of working for the health staff and the villagers to keep the functions that will be formed through the project. Project Assistant/ Translator (PA) deals with the official documentation with the relevant ministries for the project to be operated in accordance with the Lao government policy on iNGOs. PA will be in charge of logistic work and administrative support wherever necessary. PA serves as a project translator for any kind of documents, reports or letters as well as simultaneous interpretation for the expatriate staff (mainly Country Director) in internal/ external meetings or when conducting the field activities. · Facilitate/ prepare Operation Permit extension, Work Permit for expatriates, stay ID, visa etc in collaboration with the office assistant. · It may involve travel to Vientiane for the visit relevant authorities. · Collaborate with Office administrator to make sure the filing and documentation system. · Help accountant if necessary. · Contribute to preparing regular reporting to the donor, partners, or head quarter with the team. - Graduated collage/ university (or equivalent) preferable. - At least 3 year working experience, preferably, as translator/ interpreter, Manager assistant etc. - Understanding and respect of the organisational principles for integrity. · Benefit package will be provided according to the Médecins du Monde Japon’s standard upon successful completion of probation period. · Salary will be set according to experience and qualifications based on the Médecins du Monde Japon’s standard. 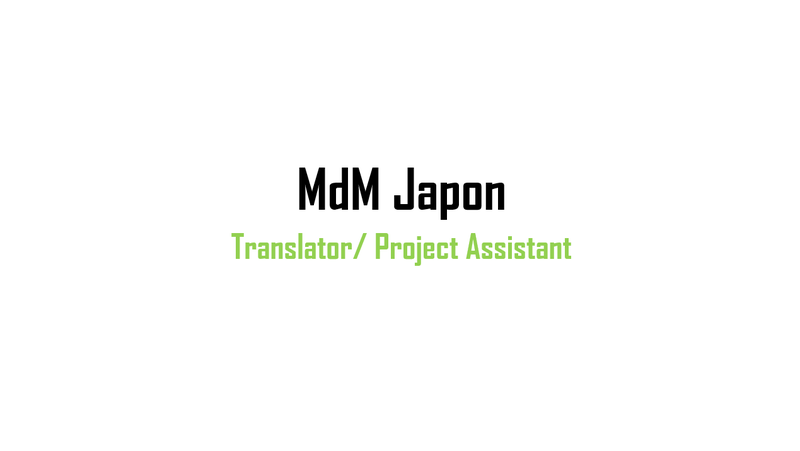 · Médecins du Monde Japon considers housing in case the applicant should move from other provinces/ district for taking this position. · An application letter is in both English and Laotian. CV in English. Please show your qualification relevant to this position in your application documents. · Due date: before 20th April 2019. *The recruitment may be closed any time before the due date when found a suitable candidate. If the documents are not sufficient enough, they will be excluded from recruitment process. No return of the documents.